The movie is based on a true story; the main character, Breaker Morant, is a folk hero in Australia. Three Australians, members of the Bushveldt Carbineers, are court-martialled by the British for shooting Boer prisoners. They don’t deny the facts but their defense is that they were following orders. Their defense attorney is given one day to prepare his case. This 1979 movie is one to watch and discuss with teenagers. What are the rules in guerilla warfare? What are war crimes? The movie didn’t bring this out, but Kitchener established the first concentration camps during this war. on the Boer side, of course. We don’t want to give them one. The Germans couldn’t give a damn about the Boers. What I would give to have Sonja’s South African perspective on this movie. There is some language and war scenes that don’t wallow in graphic displays but are nonetheless brutal. This is a movie that will stay with you and provoke many thoughts long after the credits have rolled. 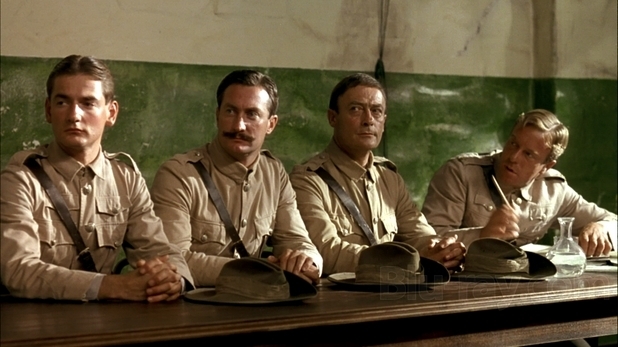 Not until I paid attention to Breaker Morant, did I realize that Bruce Beresford directed the last two DVDs we watched. [He also directed Paradise Road (one of my favorites on the power of music in war), Driving Miss Daisy and Tender Mercies. 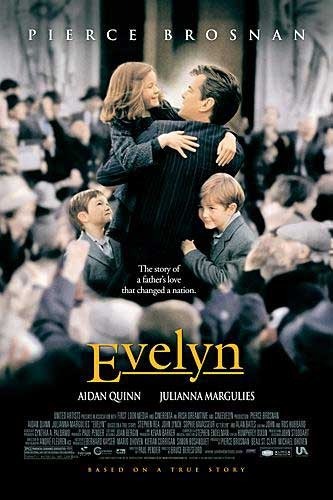 Evelyn tells the true story of Desmond Doyle, an unemployed Irish man who lost custody of his children to the government after his wife deserted him. Once his finances improved he wanted his children back. The government tells him to wait until the kids are sixteen. He challenges the law, eventually to the Irish Supreme Court. This is another movie with obvious discussion points: when is it appropriate for the government to intervene in family life? Whose kids? What are parental and paternal rights? Are father’s rights different than mother’s rights? Should they be? The acting in this film is not top rate, although Sophie Vavasseur plays the role of young Evelyn with perfect pitch. She is not the sacharine cutesy-pie many eight year old girl’s roles become. A few scenes are written, paced and played with excellence. The kindest thing to say about Pierce Brosnan’s singing voice is nothing. Woe! Whoa. The cinematography is lovely, but hey, it’s Ireland! How could it be other than lovely? The historical aspect of the story kept our attention more than anything else. Language is an issue in this PG movie. One favorite Irish exclamation is “Jesus, Mary and Joseph!” often abbreviated. It has more grit than a Hallmark film, but will have you cheering at the end. This entry was posted in Uncategorized and tagged dvds by alivingpencil. Bookmark the permalink. 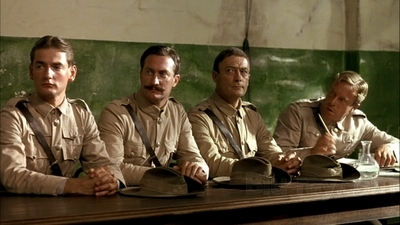 Yes, I’ve heard of Breaker Morant and really enjoyed it when I saw it way back when. I agree that it’s a good one to watch for exploring moral dilemmas. Even today with the military courts addressing crimes against terrorists and the like, it seems like Breaker Morant could be timely. Loved Evelyn and thanks for the discussion questions. We’ll have to put this back in the queue. Pierce sang better in Evelyn than in Mama Mia! Thanks for the other recommendations, too! I’m off to update the queue. I remember both of those films from a couple of years ago. Those were the days I could stay awake for the whole thing! @wonderloveandpraise – Steph, this is a grrrreat story on many levels. “Standard Issue” =D “After a fashion” =D)) And water breaking immediately before Christmas Eve service is the most appropriate time I can imagine to say “Jesus, Mary and Joseph!”Oh, Stephie girl, you take the cake. @wonderloveandpraise – I can’t wait to hear it…IN PERSON! Carol, we will keep our eyes open for the movie, i.e haven’t seen it yet (dh knows the history) – will keep you posted. Another q: I want to invest in an i-pod / mp3 player?? for downloading audiobooks – what will you recommend? @sonskyn – Sonja, I have to admit that I have two: an ipod that was a gift and a Sansa that I bought because the book program I use the most doesn’t work with ipod. The Sansa SanDisk has 4.0 gigabytes and holds several books. The Ipod is great (80 GB) and even holds movies, but I can never imagine myself watching a movie on that little screen. My sense (ignorant and mostly uninformed) is that the graphics are what require so much space. If your main purpose is to listen to books, I don’t think you would require the big guns. I’ve downloaded Tolstoy’s War and Peace and I’m thinking about listening to it on my daily walks throughout the summer. I think it is 38 hours of listening.The movie is older…made in 1979. It may not interest you or your husband, but I know you would have a more informed view on the history. You are welcome! geniet jou dag to you too!